The Grey Crowned Crane, scientifically known as Balearica regulorum gibbericeps, was chosen as Uganda's national emblem because of its beauty and elegance. 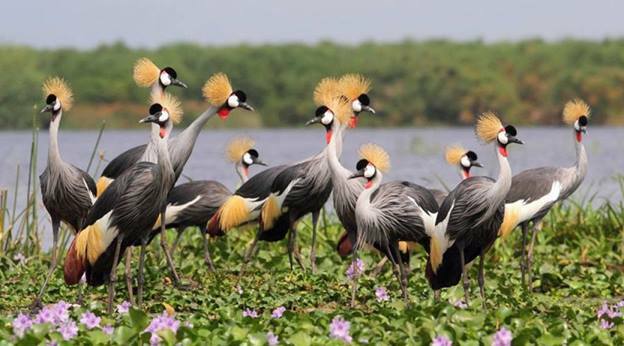 Commonly called the Crested Crane, it is a bird of national significance to Uganda, occupying a prime position on the country's national flag and coat of arms. The Crested Crane has been Uganda's symbol for nearly 100 years. The Crane is definitely an object of great beauty. It is a tall bird standing well over three feet, on long-slender black legs. Its neck is almost as long as its legs and towards the base, pointed pearl-grey feathers are elongated to form an ornamental fringe. The tail feathers, comparatively short, are the colour of dried straw. When at rest, the Crowned Crane seems to be enveloped in a cape of exquisite delicacy with its multi-coloured head where the three colours of the Uganda's Flag (Black, Yellow, Red) seem to be represented. The conspicuous velvety black forehead, yellowish crest and the vivid bright red wattles, make the Crested Crane an elegant creature, befitting its emblematic role. Please check out this link: https://goo.gl/6m7Ewj for more Facts about Uganda's Crested Crane.